Situated in the stunning Burren landscape, a source of inspiration for, and in many cases, an adoptive home to artists of all genres. 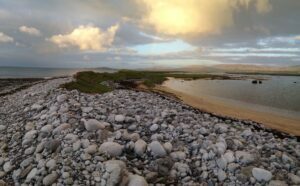 There is a certain consciousness, a momentous and fragmented state of being, which the landscape of the Burren rouses. This awareness is concentrated in intensely sensuous junctures. It allows unprecedented, and highly personal engagement with the individual life-world. At times, it seeps so far into our fissures that we fracture. This breakage uncovers naive strata below, and so the process continues. Located on the west coast of Ireland in County Clare, The Burren has long been a source of inspiration for, and in many cases, an adoptive home to artists of all genres. Poets, novelists, painters, sculptors, musicians and playwrights have absorbed its spectacular bare and stony beauty and created a multitude of rich works which continue to be enjoyed and appreciated. Some of those who have been so inspired include W.B. Yeats, one of Ireland’s best known and much loved poet-dramatists; the acclaimed Irish-Australian painter, Sir Sidney Nolan; Richard Long, the English artist; Seamus Heaney, the internationally renowned contemporary Irish poet, and British Poet Laureate, Sir John Betjeman, all of whom have immortalised the mystical beauty of the Burren in their work. Though bare at first glance, the stony outward face of the Burren is far from barren. Within the many crevices and cracks, which punctuate its craggy pavement hills, grow some of the world’s rarest flowers. This remarkable terrain is also home to a rich variety of fauna. Its equally lively bird and marine life is interesting too for the sheer diversity and quantity of species. Virtually every field, every wall, every stone formation has its own remarkable story to tell, detailing the history of Irish civilisation going back over 7,000 years. Ancient monuments abound in the area and can be easily explored. They include megalithic tombs, prehistoric burial mounds, Bronze and Iron Age forts, ancient settlements and field systems, churches, monasteries, graveyards, holy wells and medieval castles, of which Newtown Castle is one. Human civilisation came to the Burren shortly after the end of the Ice Age, 10,000 years ago. 500 ring forts and some 75 wedge tombs of Neolithic origin have been found in the region. The magnificent portal tomb at Poulnabrone is one of the most easily recognised monuments in Ireland. The Burren was home to some of the earliest education in Europe, with the monastic school at Kilmacduagh training missionaries in the 7th century; the law school at Cahermacnaughten; ad the bardic school at Finavarra thriving between the 6th and 16th centuries providing the precedents that inspired the founding of the Burren College of Art.